Welcome to the second round of the fourth annual Strongest Town Competition! We’re down to our top eight contestants, and for this round, we asked them to cut back on the text and instead send us five photos, with a caption for each explaining how it illustrates the strength of their city. Check out the photo submissions from two of our elite eight contenders below, and cast your vote at the bottom of the page! If you’re having trouble deciding, stay tuned—on Wednesday, we’ll publish some brief commentaries from Strong Towns members on each of the contestants. We’ve asked them to reflect on what they’ve seen from our towns so far, and how it aligns with the Strong Towns approach to growth and development. Voting closes at 12pm CDT on Thursday, March 28th. Click here to revisit the Round 1 match-ups. The New Rochelle of tomorrow is a high-density, transit-rich, equitable City unlike any other in the world. Here is a visualization of the completed New Rochelle skyline, based on real-scale 3D-Modeling of all of the development projects currently underway in New Rochelle. The approximately twenty projects with approvals from the City feature over 4,000 new units of housing of all types and affordability, square footage for new stores and restaurants, and new parks, plazas and public spaces throughout the downtown. All of these projects are made possible by the City’s new Downtown Overlay Zone Form-based Code and streamlined development review process. Photo Credit: Crafted, Inc. Click to view larger. At the heart of the City of New Rochelle is an unparalleled sense of community; where the dedication and support of active volunteers and City leaders help to elevate neighborhoods to new heights. One such example is the City’s public-private partnership with nonprofit Grow! Lincoln Park Community Garden, who have transformed a section of Lincoln Park into a thriving community garden and education center for area youth. 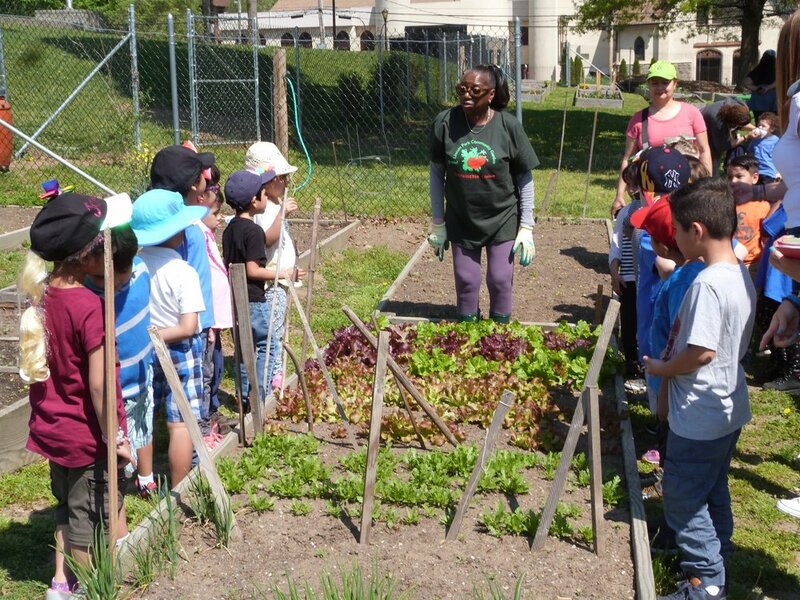 Hundreds of young people in New Rochelle are now equipped with the knowledge of the importance of urban agriculture, environmental sustainability, and economic development. Activities in the garden go well beyond planting and harvesting to include yoga, music, cooking (with garden ingredients! ), and art. 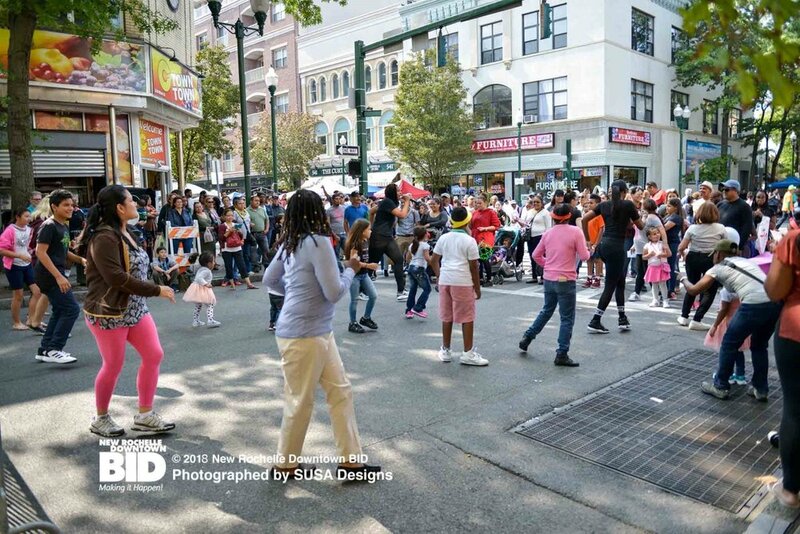 New Rochelle knows that the street is the epicenter of civic life, and where residents, visitors, and businesses can interact freely and develop a sense of place. Moreover, when the street is turned back to pedestrians, activity and culture naturally blossom. Many times a year in New Rochelle, the rights-of-way are given back to the people for the purpose of celebrations, festivals, street fairs, farmers markets, and parades. Here, the annual New Rochelle Street Fair involves all the stores along Main Street turning inside out and bringing their business outside to the people; all in the name of culture and community. Photo Credit: The New Rochelle Downtown Business Improvement District. One of New Rochelle’s Greatest assets is the beautiful Long Island Sound just steps away from the heart of a bustling downtown. When you need to get away from it all and just put your toes in the sand, Glen Island Park in New Rochelle can deliver. Here, sunbathers on the crescent-shaped beach enjoy the sounds of soft, lapping waves while they soak up some vitamin D.
You don’t have to live in New York City to experience a City on the cutting edge of technology. Whether it’s free municipal Wi-Fi throughout downtown, or a city-wide electric scooter share program, New Rochelle knows what it means to be forward-thinking and forward-doing. In 2018, New Rochelle was selected as the Bloomberg Philanthropies Mayor’s Challenge Nationwide Winner, for its efforts in developing a municipally-led virtual reality start-up and incubator in its downtown – the first of its kind in the country. This IDEA Lab (Interactive Digital Environments Alliance) will utilize state-of-the-art virtual reality and augmented reality applications to help engage and empower its residents in the City’s planning and design process. Each of our three elementary schools, our middle school, and our high school have a number of students who walk, bike, or skateboard to school. We have made investments in our sidewalks and crosswalks, employ crossing guards, and recently installed an improved bike lane, protected from cars, that leads from the downtown to the high school. Portsmouth has been, and still is, a working port. Cargo ships are escorted down the Piscataqua River by a fleet of tugboats, and carry oil, sand, salt and other materials that get loaded onto trains and trucks for transport. Two of our three bridges connecting New Hampshire to Maine are drawbridges, and it never grows old, watching these massive ships come down the river. According to the latest Americans for Arts Economic Impact study, Portsmouth and the New Hampshire seacoast host nearly 50 nonprofit arts and cultural organizations. At $53 million annually, Portsmouth resembles a city five times its size in terms of the economic impact of arts and culture. This image is of a crowd of concert-goers in Prescott Park, enjoying music on the banks of the Piscataqua River. The city takes pride in its effort in sustainability, renewable energy, coastal resiliency, and environmental best practices. Pictured here is one of two solar arrays operated by the city, and just a small part of a multi-pronged effort to reduce our carbon footprint and address climate change. This image features a float created by a community group in our annual Holiday Parade, just one of many community events in Portsmouth throughout the year. From parades to rallies, to fairy house tours, and fundraising walks, there are hundreds of community-driven events throughout the year in Portsmouth.